Liz Did It: Eat My Dust Rachel Ray! Eat My Dust Rachel Ray! I have never understood why people think Rachel Ray’s philosophy is so magical. If I had to invest more than 30 minutes into making dinner each night, I would be one skinny broad. With a vacation coming up next week (Yayyy!) I have been stingy with the grocery shopping. Time to do fridge clean out and creative cooking. The result? 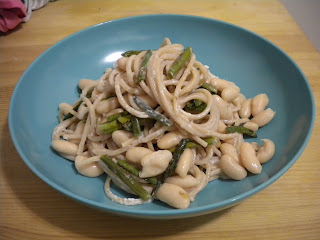 Whole wheat spaghetti with roasted asparagus, cannellini beans, and “cream” sauce. The recipe for 4 portions is as follows. While I put a pot of water on for the spaghetti, I chopped the asparagus into bite size pieces, drizzled with olive oil, salt, and pepper, and popped them into a 400 degree oven. I cooked the spaghetti, drained it (but saved about a cup of the cooking water), and threw it back in the pot. I took the asparagus out of the oven at the same time the pasta was done. Here is where my wackadoo idea with the cheese wedges comes into play. I dropped in the wedges and stirred them around with the spaghetti but they weren’t really melting. I started mashing them into the bottom of the pot with a spatula, and voila! Melty goodness. I added in a little bit of the reserved cooking water to thin it out, and added in the asparagus, beans, and a little parm. I have to say, this came out pretty amazing. It satisfies that craving for bad food like fettuccini alfredo and there really is nothing bad in it. I have been eating it for lunch all week. And the fact that it was done in about 20 minutes is even better! Take that Rachel Ray!